Between 2008 and 2009, the Collaboration for the Young Generation in Mekong region (CYM) – a regional program of the Thai Volunteer Service Foundation (TVS) – initiated a new process for the young generation to share their experiences, ideas, and local and regional socio-cultural situations. The Mekong Youth Camp, ASEAN Youth Camp and ASEAN Peoples’ Forums were important spaces for a growing youth network to approach ASEAN policy-makers. 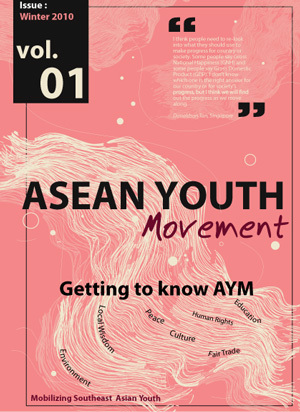 More than 150 youth from nine ASEAN countries participated in these activities and through their strong intention to build a youth network, ASEAN Youth Movement has developed to bring together more youth in our region. efforts for a better society. We are not an organization – we are trying to create a communication network, which can bring together, organizations, networks, groups or clubs interested in connecting with others and exchanging information. We call ourselves a movement because many of our participants are activists – actively participating in society, working in community development, politics, the environment, human rights and many other issues. The most important thing is that we are all active youth, and when we come together, we believe that we can call ourselves a movement. We aim to bring youth together and support our friends’ efforts for social change through youth-driven media and communication.